I received an e-mail about a month ago from a freelance writer who wanted to contribute a guest post to my blog. I told her I was happy to post anything that was on topic and she sent me the following article. I hope you find it interesting, and if you’d like to have something posted here, I am open to it, just contact me. In the early 18th Century, the ruling establishment consisted of the monarchy and the church, and they were intolerant of anyone who challenged the status quo. One early victim of the oppression of secularism and free speech was a young boy who died a most appalling death, and who is still celebrated in Paris as a symbol of man’s right to speak freely. His story is a salutary one, but not widely known outside Europe. The year is 1765. It is August, and in the dead of night someone pulls down and vandalizes a wooden crucifix, which stood on a bridge at Abbeville. The Bishop of Amiens flew into a rage when it was discovered the next morning and demanded the vandal be brought to justice. The town was silent. People either had no idea who had done it or were shielding them. The Bishop threatened to excommunicate anyone withholding information, but still no one came forward. Finally, a local magistrate called Du Maisniel de Belleval used the awkward silence to accuse a young nobleman, a student against whom he had a grudge. The boy was just nineteen years old and, although history does not record the exact reason for the magistrate’s grudge, we can imagine that he was perhaps just a normal teenager, full of high spirits, and somewhat mischievous. Jean-François de la Barre was arrested and charged with a range of offenses against the church. Jean-François de la Barre was charged with failing to doff his hat as a procession of monks walked past; of tearing down the cross on the bridge; of singing ‘lewd’ songs, and finally of owning seditious literature. These charges are hard for us to think of as criminal offenses, but in the 18th Century they were grossly offensive to the Church, who set about making an example of their black sheep. Which of these charges, if any, were true is contested. Someone had to pay. 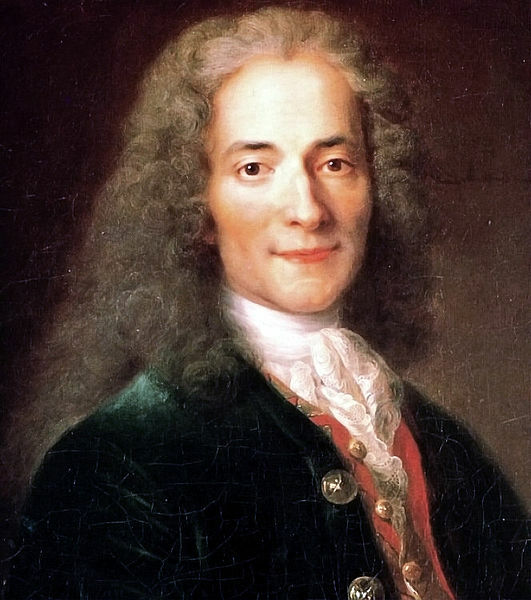 Voltaire took up the boy’s case, since the book he had been found in possession of which so outraged the Bishop was one of Voltaire’s own, the Philosophical Dictionary, first published in 1764. It contained alphabetically arranged articles, some of which disparaged the Catholic Church and other powerful institutions. Not content with simply managing their own business and turning a blind eye to a mere book, the state and church were enraged by the publication of such literature and ownership of it was a personal risk. Reason is to the philosopher what grace is to the Christian… Other men walk in darkness; the philosopher, who has the same passions, acts only after reflection; he walks through the night, but it is preceded by a torch. The philosopher forms his principles on an infinity of particular observations. He does not confuse truth with plausibility; he takes for truth what is true, for forgery what is false, for doubtful what is doubtful, and probable what is probable. The philosophical spirit is thus a spirit of observation and accuracy. The topic of theology was ordered under ‘Philosophy’ since the writers argued that it was subject to human reason and not a source of knowledge. This was a scandalous assertion at the time. It was this uneasy relationship between reason and faith that formed the backdrop to the fate of Jean-François de la Barre. It was the fury felt among Catholic leaders about attacks on their power base that may account for the hideous treatment of poor young Jean-François. Owning Voltaire’s Philosophical Dictionary sealed his fate. On July 1, 1766, he was brutally tortured. His hands were chopped off and his tongue torn out. Finally, he was decapitated and his body burned on a pyre in the square at Abbeville, along with the offending literature. Jean-François de la Barre’s case was championed by Voltaire, who wrote two accounts of it – Relation de la Mort du Chevalier de la Barre (1766) and Le Cri du Sang Innocent (1775), in which he attacked the complicity of the Catholic Church in what was in fact a prosecution raised by the State. A number of offences against religion, such as sacrilege and blasphemy, survived from the edicts of the old regime. The National Convention eventually pardoned De la Barre in 1794. 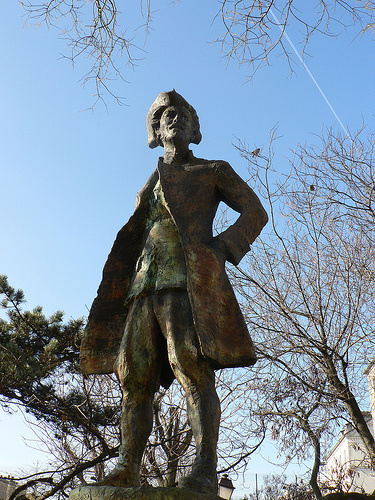 Today a statue of the boy stands in a quiet park at the top of the hill of Montmartre. Its unveiling was heralded by a celebration by rationalists and free thinkers, who held a ceremony in his honor. He was a victim of that age’s savage religious intolerance and remains a symbol for those committed to free speech today. Chevalier de la Barre Day, every July 1st, is a day that can be celebrated by anyone who opposes religious oppression.